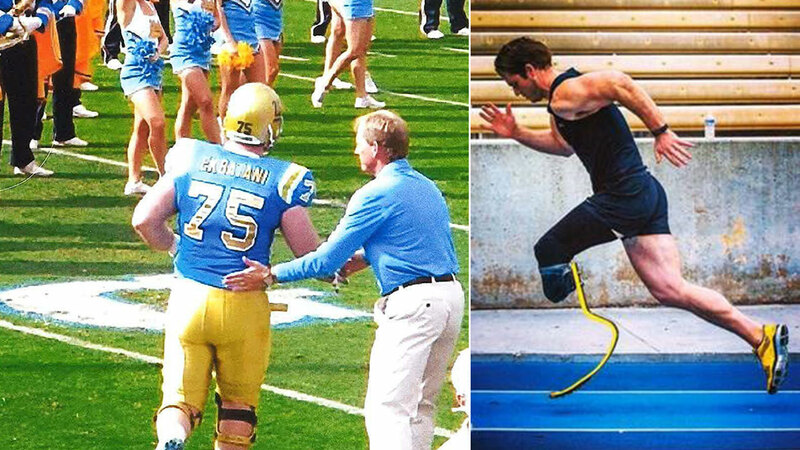 Former UCLA offensive lineman Nick Ekbatani pictured before and after the motorcycle accident that claimed his leg. LOS ANGELES (KABC) -- A jury has ordered Caltrans to pay $35 million to a former UCLA football player who lost his leg and suffered severe injuries in a motorcycle accident that he argued was caused by a dangerous intersection. Nick Ekbatani, now 29, was a starting offensive lineman for UCLA from 2006 to 2009. In July 2012, he was riding his motorcycle on Pacific Coast Highway when a cab driver turned left into him at a Redondo Beach intersection. Ekbatani suffered severe injuries and was given only a 2 percent chance of survival, according to his attorney, Garo Mardirossian. He underwent 13 surgeries, lost his leg and will need lifetime medical care. He sued Caltrans for $50 million, arguing the state agency knew the intersection at Diamond Street was dangerous and did nothing to address the issue. Nick Ekbatani, in an undated photo with members of the UCLA football team after the motorcycle crash that claimed his leg. In particular, his attorneys said they presented evidence that in 2005 Caltrans ordered double-double yellow lines to be painted in the intersection to prevent early left turns because of line-of-sight problems on the road, but they never were. They said there had been numerous left-turning accidents previously at the intersection. After a six-week trial, a Los Angeles jury sided with him and awarded him $35 million. Ekbatani also sued the cab driver, his attorneys said, but settled that aspect of the case before the Caltrans trial. No word yet from Caltrans on whether it plans to appeal.